As in 1948, the AIACR nominated the Grands Prix of Britain, Belgium, Switzerland, France and Italy as Grandes Épreuves, the last of these being given the title European Grand Prix. After the slightly mysterious withdrawal of Alfa Corse, the Ferraris were the quickest cars of 1949, with Alberto Ascari winning at Bremgarten and at Monza, but Juan Manuel Fangio won five of the lesser Grands Prix in his Maserati 4CLT. Louis Chiron took a surprise win in his Lago-Talbot at the French GP after Luigi Villoresi's Ferrari and Fangio's Maserati both retired. It was the second time that season Villoresi had started from pole and retired - he'd suffered the same fate at Silverstone in a Scuderia Ambrosiana Maserati. The only other marque to win in F1 in 1949 was ERA, Bob Gerard taking the newest of the B-Types, R14B, to victory on Jersey and on the Isle of Man as well as second place in the British GP. The F1 results used here were compiled by David McKinney and Adam Ferrington from a wide range of sources including Motor Sport, Autocourse, Autosport and the F1 Register book mentioned above. 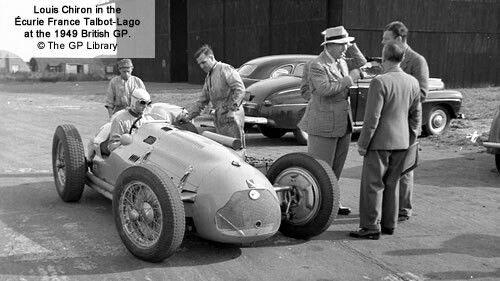 Individual car identities were then meticulously checked against their enormous libraries of books and photographs, notably Talbot-Lago de Course by Pierre Abeillon, Les Gordini by Robert Jarraud, Gordini – Un Sorcier, Une Equipe by Christian Huet and The History of English Racing Automobiles by David Weguelin. Michael Müller has contributed immaculately researched histories of all the 1948-1950 Ferrari 125s.